This book covers the principles of discovery, ethical and practice issues, and techniques and tactics to be deployed. Employ the right techniques to obtain the information that will make, or break, the case. Discovery is a central element of civil litigation in Canada. It's a mechanism to enable all parties to know the case that they have to meet, prepare for trial or resolve their disputes by an informed settlement. 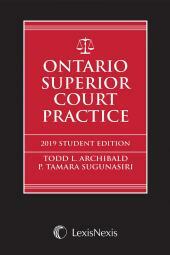 Discovery in Canadian Common Law: Practice, Techniques and Strategies covers the principles of discovery, ethical and practice issues, and techniques and tactics to be deployed. At the end of discovery, counsel should be in an ideal position to assist in educating their clients about the probabilities of success or failure at trial. The Honourable Mr. Justice Todd Archibald has been a Superior Court Justice since 1999. He is currently an Adjunct Professor at Osgoode Hall Law School and the Co-Director of Osgoode's part-time Civil LL.M. program. 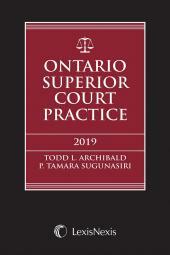 He is also the co-author of Ontario Superior Court Practice, 2018 Edition (LexisNexis Canada); Editor of the National Annual Review of Civil Litigation and a former Litigation Partner with Borden & Elliot. Justice Archibald graduated in law from the University of Toronto in 1977 and was called to the Bar of Ontario in 1979. He obtained a Master of Laws from Osgoode Hall Law School in 1985. He received the Ontario Attorney General's 2015 David Mundell medal for legal scholarship. Sam R. Sasso is a lawyer at Ricketts Harris LLP whose practice focuses on commercial litigation and insurance coverage matters. Sam graduated in law from Queen's University in 2006 and was called to the bar in 2007. 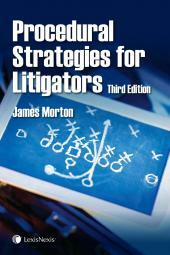 He writes on a wide range of legal topics and frequently speaks before colleagues and students. Sam built two iPad apps, D&O Policies (with Gary Luftspring) and lawyers building apps, both of which are available at the app store.